Facilities at the NNYLN are available for meetings and workshops for businesses, industries and organizations. Are you a company, business or organization that is tired of paying large fees to send your employees or members to workshops and training courses out of the area? Or are you tired of driving long distances to attend meetings? The Northern New York Library Network has the facilities you may be looking for, and it’s conveniently located right here in St. Lawrence County on Route 11 between Potsdam and Canton, NY. The Network has opened up its facilities to be used by businesses and industries that require a location for a meeting or workshop. 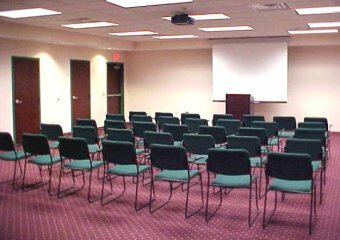 The Meeting Room has a 60-seat capacity for theater style seating (shown here), or 40-seat capacity with tables and chairs. This room has a digital projector, large screen TV and wireless or ethernet connections. The fee is: $130.00 per day; $65.00 half-day rate (maximum of 4 hours). 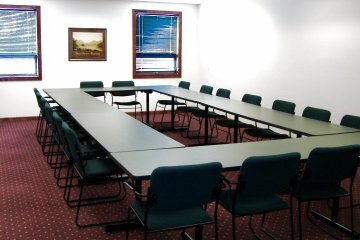 The Conference Room has a 20-seat capacity, large screen TV and wireless or ethernet connections. The fee is $100.00 per day; $50.00 half-day rate (maximum of 4 hours). The Network’s facilities are handicapped accessible; open year-round, Monday- Friday from 8:00 a.m. to 4:00 p.m.; and provide free, on-site parking for all participants. These rooms are provided to our members at no cost. Morning refreshments may also be provided by the Network for a small additional cost. To find out more about the NNY Library Network’s facilities, or to reserve a room, please contact us directly by calling 315-265-1119.